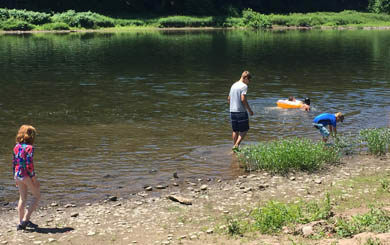 UDC Seeks Municipal Proposals for River & Shoreline Clean-ups by April 19 - Upper Delaware Council, Inc.
NARROWSBURG – The Upper Delaware Council, Inc. (UDC) is accepting applications through April 19 for its 2019 River & Shoreline Clean-up Grants Program. The grants are available to the UDC’s member municipalities in New York State (Towns of Hancock, Fremont, Delaware, Cochecton, Tusten, Highland, Lumberland, and Deerpark) and Pennsylvania (Berlin, Damascus, Lackawaxen, Shohola, and Westfall Townships). The Council has budgeted $5,000 for this year’s program. Since 2014 when the clean-ups were subsidized by $3,000 allocated for this purpose by the National Park Service Upper Delaware Scenic and Recreational River under Acting Superintendent Malcolm Wilbur, the UDC has opted to continue to sharing the federal funding for the non-profit organization’s operations with its membership in the form of River Clean-up and Technical Assistance Grants. A cumulative total of $21,630.56 has been disbursed over the past five years. The program is intended to encourage organized clean-ups in the river and along the banks to help maintain the pristine quality of the Upper Delaware Scenic and Recreational River. Priority is given to projects that get adult and youth volunteers involved, show local investment, and reflect a commitment to become self-sustaining. Respect for private property rights is paramount during clean-ups. Interested towns and townships must submit a letter to the UDC describing their project, an estimated budget with a breakdown for materials and services, the funding amount requested, and contact information for a project leader. The UDC’s Operations Committee will review applications at its April 23 meeting and the full Council is expected to vote on the awards on May 2. Successful applicants will have until August 16 to complete their projects and submit a reimbursement payment request. For more information, contact UDC Executive Director Laurie Ramie at (845) 252-3022 or laurie@upperdelawarecouncil.org.